Samudra Gupta is one of the greatest rulers to have ever ruled India, but how many Hindus do even know him? In today's India, people mostly know about film stars and celebrities but not the people who made that India possible. In such a milieu, what answer you can expect if you ask people who Samudra Gupta is? They will probably guess, laugh, say that it is the name of an Air India Boeing Jet, or may even say, "who cares?" Unless you studied Indian history with some interest, or as a subject in your graduation, or unless you visited Allahabad and saw the inscription on the Asoka Pillar, you may not know who Samudra Gupta is. Today's Indians get their knowledge of the world, history, and culture mostly through movies and television serials. However these mediums do not do much justice to such subjects, since their purpose is not to enlighten you or educate you, but make commercial profit by holding your attention. Indian movie industry has a unique opportunity to make movies about ancient India or depict its diversity of rich culture. Unlike Hollywood film producers, they do not have to borrow themes from Europe, Egypt, Rome, Greece, or Israel to make historical movies. They can dwell deep into Indian history and create beautiful movies about the great kings, queens, scholars, philosophers saints, warriors, merchants, dancers and even common people who lived in those times and coped with numerous challenges. There is no limit to the stories they can create out of their lives and actions. They can draw inspiration from hundreds of ancient Indian literary works, plays, stories, myths, legends, and travel accounts to create stories of great human value. Instead what do they do? They make movies about gangsters, dacoits, terrorists, and even idolize them, as if there is some virtue in being evil. Or they go to Europe, USA, or Australia to make a poor copy of some Hollywood or English romantic comedy where the native actors try to recreate a native equivalent of fair skinned western stereotypes that westerners themselves may often find distasteful. Alternatively, for some strange reason they will make movies like PK, or Oh My God, that denigrate Hinduism and undermine Hindu culture. When it comes to Hinduism and ancient Indian civilization, Indian movie industry tends to dabble in the muck rather than finding the gems that are hidden in the layers of its 6000 year old history. They either depict the native culture in a poor light with bias or totally dramatize it and idealize it in an absurd fashion that people do not find it convincing or believable. Their overall intent and purpose seems to be not to make you feel good about your religious identity and your cultural past but rather feel bad and imperfect. As pointed out in a recent article by a writer, while movies like Matrix, Star Wars, and many science fiction movies of Hollywood draw inspiration from Hinduism and Hindu philosophy, the Hindi film industry In India has come out with a science fiction based movie like PK to denigrate Hinduism and insult its people! They also tend to glorify or romanticize that part of medieval Indian history when Muslims ruled India, ignoring that the same characters whom they idolize in the movies had massacred millions of Hindus. As a result, today people know more about the Islamic culture, and in a rather distorted way more about Muslim rulers such as Mohammad Bin Tuglakh, Akbar, Shajahan, Babar, or Aurangazeb, (the ones who really mass murdered Hindus) rather than the Hindu, Buddhist, Jain, or Sikh counterparts who ruled the Indian subcontinent. It is in this context we want to present to you Samudra Gupta, one of the greatest Hindu rulers who played a significant role in preserving Hinduism for posterity. Our knowledge of Samudra Gupta comes to us mostly from the Allahabad Pillar inscription. The pillar originally contains an edict of Asoka in Brahmi scrip inscribed in 3rd Century B.C.E. Below that you will find another inscription in Sanskrit, which was composed in Brahmi script almost 700-800 years later in 4th Century C.E., by Harisena, a court poet of Samudra Gupta. It speaks about the conquests and achievements of Samudra Gupta (4th Century C. E) of the Gupta Dynasty who consolidated his empire through numerous conquests and revived the glory of Hinduism. From the inscription you will know that the military adventures of Samudra Gupta were no less significant than those of Alexander, whose greatest foe in terms of military might was King Darius, whereas Samudra Gupta fought more formidable enemies and sophisticated armies and achieved victories not only against native kings in the North, South, East and West but also many forest kings and foreign kingdoms. He marched all the way up to Manipur and Nagaland in the East, Nepal in the North, Gujarat, Rajasthan, and Punjab in the West, and Tamilnadu in the South. Even the Kushanas who are mentioned in the inscription as Sahanshahis and who ruled parts of Iran, paid tribute to him. He also did not spare the tribal kingdoms (atavikas) in the forests of northern and central India. Due to the many battles he fought, he was known as a hero of a hundred fights. According to Harisena, he was wounded so many times during the wars that his body was covered with marks of a hundred wounds caused by the blows of arrows, spears, pikes, swords, lances, javelins, iron arrows and many other weapons. V.A. Smith, a British historian with his typical colonial mindset called him the Napoleon of India, ignoring that Samudra Gupta preceded him by nearly 1400 years. He was also a devout Hindu who worshipped Vishnu. After completing his conquests and consolidating his victories, he performed Asvamedha Yajna or the Vedic Horse sacrifice. As the historian, Dr.A.S.Altekar, stated, no other king of India either before him or after him had a greater justification to perform it. According to Dr.R.C.Majumdar, his empire consisted of "the entire northern India (except Kashmir), Western Punjab, Western Rajasthan, Sindh and Gujarat, with the high lands of Chhattisgarh and Orissa, and a long stretch of territory along the eastern coast extending as far as south as Chingalpet and probably even further." These areas were either directly under his administration or under the control of the rulers who acknowledged his suzerainty and paid him tribute. According to the Allahabad inscription, besides a great warrior, he was a generous Hindu king who gifted hundreds of thousands of cows from the wealth he lawfully earned by his merit not from plunder. He was a lover of music and arts, who patronized poets and scholars. He also earned the epithet, king of poetry (kaviraj) since he composed many beautiful poems in Sanskrit, " putting to shame" even the best composers. Like most Hindu kings of ancient India he practiced religious tolerance and maintained good relations with kings of other faiths. For example, he maintained friendly relations with the Buddhist king of Ceylon and granted him permission to build a monastery at Bodh Gaya, the place where the Buddha got his enlightenment. He also practiced good diplomacy to maintain good relations and communication with foreign rulers and neighboring kingdoms. 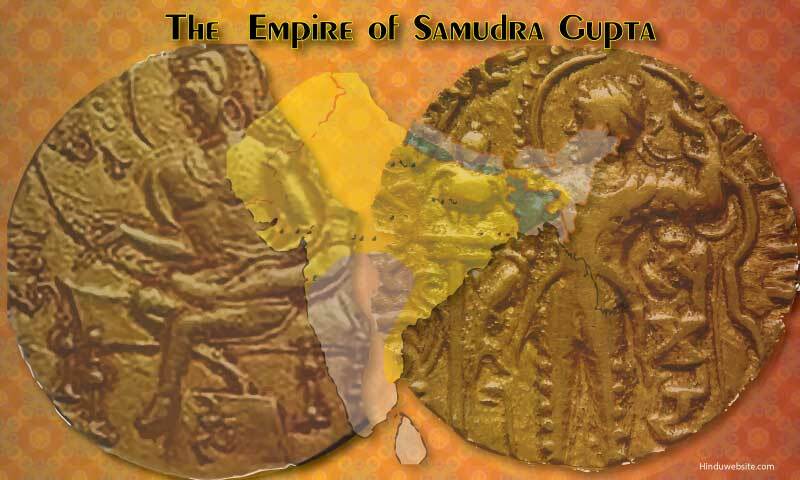 The age of the Guptas is known in Indian history as the Golden Age (swarna-yug). Through his conquests and administration, Samudra Gupta laid its foundation and ushered in an era of peace and prosperity for the people in the subcontinent. His immediate successors were also Hindus, who exemplified the Hindu way of life in their own conduct and revived the idealism and values of the ancient Kshatriya kings. They played no small role in the continuity of Hinduism against the challenge it faced from Buddhism and Jainism. They were probably the last of the famous Hindu kings who upheld Brahmanism and reinforced the Vedic beliefs and practices in a wide geographic areas. According to most historians, people in the Gupta period enjoyed peace and prosperity and led a highly moral life. The kings as well as people pursued the four aims of human life (purusharthas), namely Dharma, Artha, Kama and Moksha, and worshipped various gods. They made pilgrimages and the temple traditions of Hinduism more popular by building many Hindu temples, some of which exist even today. Hindu culture and way of life also received a distinct boost during the same period. As noted by Fahien, a Chinese traveler, both men and women wore ornaments, dressed in the typical Indian fashion, ate both vegetarian and non-vegetarian food, and enjoyed festivities, but mostly avoided the use of wine, onions, and garlic. It is possible that he was referring to Buddhists since he interacted mostly with Buddhists during his stay in India. However during his travels through the common thoroughfares and caravan routes of the country he could not have missed noticing the Hindus and their way of life. Hunting and celebration of Hindu festivals were popular recreations among the nobility. The Gupta period also witnessed the rise of women in public life. Women occupied higher positions as governors and heads of villages, and received education. Some of them were well-versed in religious and spiritual knowledge and participated in religious debates. Widow marriages were also known. Although society was divided into castes and sub castes, inter caste marriages were not uncommon, and they led to the formation of several mixed castes. Samudra Gupta was one of the many great kings who made Hinduism possible. There were many others such as Pushaymitra Sunga, Kanishka, Gautamiputra Satakarni, Kharavela, Rudradaman, Harshavardhana, Pulakesi, Rajaraja Chola, Sri Krishna Devaraya, Rani Durgavathi, etc., whose lives were colorful and eventful like any medieval king we know. Hindus should know about them and through them about their religion and its history. They should not solely rely upon movies, television serials, and pulp fiction to know about their culture, religion, scriptures and heroes. They should also learn about their history through genuine sources that are free from secular, ideological, and sectarian bias. Such knowledge will help them ensure the continuity and preservation of their unique cultural identity and their own family traditions. If not, their future generations will suffer from the same fate as the people in Africa and Latin America as second or third tier Muslims and Christians, subservient to the culture of Europe and Arabia.